Have you ever encountered such a situation where you need to look for separate docking unit catering for different models of your mobile device? It would be ideal if we can have a standard universal docking station that can cater for all of them. However, due to physical design and form factor constraint, this is not always possible. 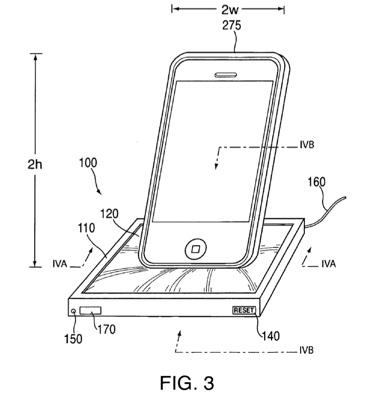 In order to resolve the inconvenience, Apple Inc has recently filed a new patent idea with intention to standardize its docking station so that it can be used for both iPod and iPhone devices without the need to alter its original device design. The idea behind is the next generation docking station will be based on a sponge-like material and with its nature of elastic characteristics, it can easily conform and hold different devices regardless of its form factor and more importantly, it will be able to synchronous seamlessly as a universal docking unit suitable for home and office environments. That is not all, the patent idea further disclosed that the docking base will able to retain the original foot print of the devices that was mounted earlier and eventually allows a much faster docking capability at any time. And with a single button press, it will reset the base ready for next device usages. Similar to other patent ideas, there is still no actual implementation date or when we can expect it in commercial market, but this is definitely the most preferred way of synchronization just like standardization of charging solution approved by ITU earlier.